Registration for the member's only website 'mybc' is quick, simple and best of all, it's free - are you need are your Bartercard card details. If you previously had a MTP login, you can enter your username and password from the MTP, and migrate those details across, or create a new account. Update your contact details anytime through Personal Details located under the My Profile menu. Your Trading Plan can also be updated online at any time either directly, or with the help of your Trade Broker. Keeping this updated helps us to identify the potential spending opportunities that you are looking for. This allows you, at any time, to process a sale from another member directly into your account instantly. If you have obtained an authorisation prior to commencing work, you can even finalise that transaction online by processing the transaction when the job is done. Buying and Selling on the internet has never been easier! Build your online shop with mybc. 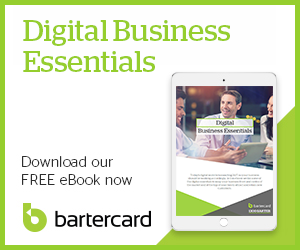 Visit mybc.bartercard.com today and DO IT ONLINE! Click here to download the full MYBC guide.